The 13th and 14th episodes of The Asterisk War, called respectively “Divine Revelations” and “Corrupt Ruler,” pick right up where the last season left off. Amagiri Ayato is still recovering from his last match, and we get to meet a maid from Julis Riessfeld’s household! Xinglou tries to convince an underlying to recruit Ayato. The student council president is considerably more cunning than she looks. Capture from the Crunchyroll stream. At the end of last season, everyone watching the match saw that Amagiri Ayato’s power was time-limited. Now, the schools and their competitors have analyzed the match and have a good idea of what that time limit is. Julis Riessfeld, who is partners with Ayato, pragmatically devises a strategy for the next match with Song and Luo. They are disciples of Fan Xinglou, who is the student council president of the Jie Long Seventh Institute, and they are both highly ranked. As both teams take the stage to begin their fight, Song and Luo say that the would have preferred to right Ayato and Julis when Ayato was at 100%. They also said not to take what was about to happen personally. Both of the Jie Long students attack Ayato. As they back him into a corner, Julis calls forth a wall of flame that forces her to fight Luo and Ayato to fight Song. As the Jie Long combatants press their attack, Julis and Ayato maneuver them to a pre-determined locations. Julis fires the signal, Ayato releases what little power he has left, and the two dive through the flames to strike each other’s enemy. The match ends. Afterward, Luo and Song offered their congratulations and a warning. The next team Julis and Ayato will face was also from Jie Long, but that team viewed honor very differently. The twins Li Shenyun and Li Shenhua rely on deceit and cunning. Not only that, they are arrogant to a fault. The sisters confirm this when they interrupt the other four. They ironically apologize on behalf of their master for having fielded two “lame” fighters like Song and Luo. The sisters pledge to make up for it by showing the world what disciples of Fan Xinglou can really do. As they’re planning for the next round, Sasamiya Saya and Toudou Kirin arrive with a guest: Flora Klemm, one of the maids in waiting from Julis’ home. The king promised Flora tickets to the Festa if she surprised Julis. After Ayato asks what Julis was like when she was young, Flora shows all sorts of pictures from Julis’ past, mostly from when she helped the orphans. 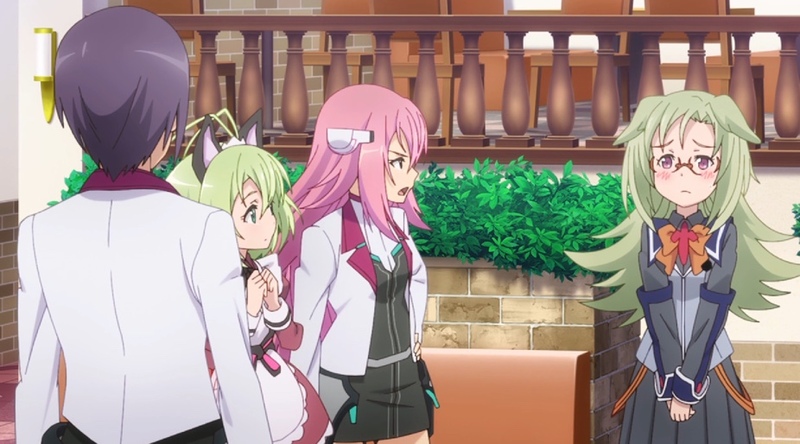 Flora then confesses that she wants to become a student, too, so she can follow in Julis’ footsteps. That night in his room, Ayato brooded about his sister, Amagiri Haruka. He had earlier told Julis that he wouldn’t actively look for her if she didn’t want to be found, but he found he could not drop it. He calls Irene Urzaiz, who correctly guesses that he’s calling to ask for help arranging a meeting with Dirk Eberwein, student council president of Rewolf Black Institute. She agrees to let Dirk know Ayato wants to talk about his sister. She also warns Ayato to watch his back. The next morning, Yabuki Eishirou, Ayato’s roommate, returns. Having watched more Festa matches than Ayato, Eishirou tries to prepare his roommate for the Li twin’s Taoist attacks. Korona wasn’t prepared for Julis to demand to attend the meeting with Dirk. Capture from the Crunchyroll stream. Ayato meets Julis and Flora for lunch at Flora’s request. It turns out she didn’t just visit Julis for fun (though it’s clear that Flora’s enjoying herself!). Much to Julis’ embarrassment, Flora begins asking Ayato questions about his relationship with Julis. Apparently, her brother the King wants to see what kind of man his potential son in law is. As Julis shuts down the questioning, Kashimaru Korona, Dirk’s secretary, asks them to join her in a limo. In the limo, Julis has a hard time letting go of what Dirk put them through at the end of last season. Ayato, though, asks her to set it aside for Irene’s sake (he doesn’t want to make Dirk any more angry with her). Ayato guesses that he has something that Dirk wants. Dirk confirms that without the possibility of an exchange, he would never have agreed to the meeting. He tells Ayato that he last saw Haruka at the Eclipse Festa, which was a short-lived and bloodier alternative to the Phoenix Festa. Of course, that Festa was a favorite among the city’s wealthy. Haruka lost a fight but was still alive; that’s all Dirk knows. In return, Dirk asks why Madiath Mesa seems to know Ayato. Madiath is a member of the Ginga, which is the governing body of Ayato’s school, Seidoukan Academy. He is also the Chairman of the Festa Steering Committee. Dirk appears concerned that Madiath showed an interested in Ayato. Ayato, though, responds that he has no idea. Satisfied with the answer, Dirk stops the car and drops them off in the middle of nowhere. The latest revelation about his sister has Ayato wide-eyed with shock as the car drives away. Korona breaks the silence in the car by telling Dirk about the “adorable little girl,” dressed as a maid, who was not an Asterisk student and who was with them in the restaurant. Dirk asks her to tell him more about that little girl. Reference to the Wood faction (Lou and Song) and the Water faction (Shenyun and Shenhua) within Jie Long Seventh Institute gave the story extra depth. I enjoy the multi-faceted and multi-layered political structure that unites the schools; I think it’s fertile ground for drama. 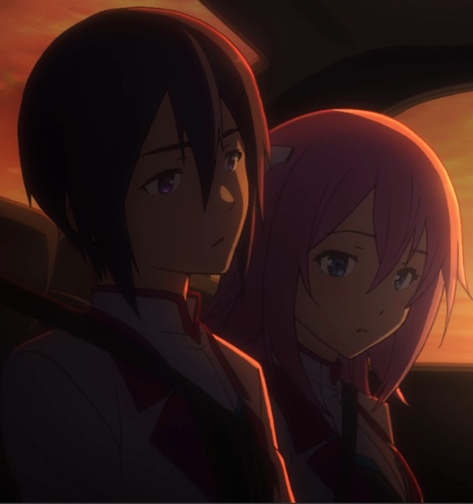 Ayato and Julis’ quiet moments add a maturity to the show. They’re also a good counterweight to the actions scenes. Capture from the Crunchyroll stream. The quiet moments between Ayato and Julis are growing, and I think they show a level of maturity I haven’t seen as often as I like. They’ve come a long way since he groped her in the first episode! Before the credits in episode 13, Julie touched his upper arm, and they just talked. No blushing, no panicking, no nose-bleeds. Just two adults talking. Very refreshing! These moments are a great contrast to the action-packed battles, too. In the 13th episode, the announcers took a few moments to re-introduce the leading contenders. I thought that was a fast and welcome way to remind us viewers who the main characters were. An off-season seems like a long time! I’m a sucker for honorable warriors, and that’s why I liked Song and Luo. Their view of the world might be a fantasy, but it’s a pleasant one. It was nice seeing Saya and Kirin again. Saya was her laid back and casual self. She remains one of my favorite characters in this show. I love Saya’s quote, “That our Riessfeld. 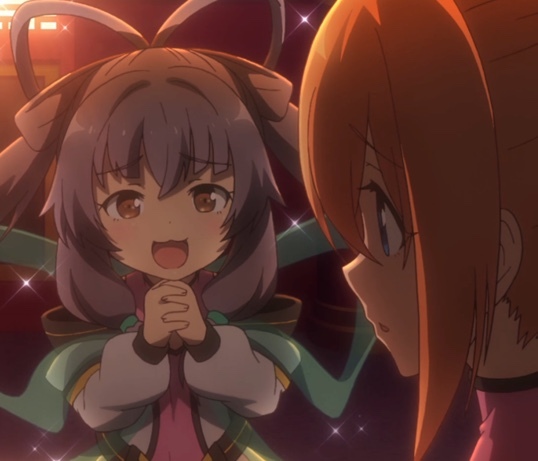 Your goals are lofty and epic!” She then went on to say that Julis shouldn’t plan on giving the Festa prize money to the orphanage because she and Kirin were going to win the Festa. That might well leave a reason for Flora to win later! It was fun to see Priscilla Urzaiz and Irene again, just as it was nice to see Priscilla thank Ayato for breaking the Gravi-Sheath’s crippling hold on her sister Irene. Irene teased Ayato about how hard he seemed to work during the match. Authentic camaraderie — just another something this show has to offer! After he finished talking to them, Dirk dropped Julis and Ayato off in the middle of nowhere. Obviously, in that world they could easily summon a cab, but I thought that Dirk summarily ejecting them from the car was perfectly in his character. The animation seems spot on again. The use of light and shadows, the vibrant colors in the city, and the fidelity of the characters make this a solid offering. Shenyun and Shenhua are shaping up to be quite a handful for Ayato and Julis. Capture from the Crunchyroll stream. The first two episodes of this season re-established the dramatic inter-school tensions as well as the main characters. We got to see a little more of Fan Xinglou’s personality (the little hedonist! ), and we got an introduction to the Li twins, who look like they’re going to be tough competition for our heroes. Seeing Saya, Kirin, Irene, and the others, not to mention Julis and Ayato, felt a lot like getting reacquainted with old schoolmates. I hadn’t realized how well The Asterisk War developed its characters. Towards the middle of “Corrupt Ruler,” I had a sense that the second season’s plot was really picking up steam. Julis and Ayato were beginning to prepare for the match with the Li twins; Ayato learned about his sister’s participation in the Eclipse Festa; and Dirk apparently sees a way he can use Flora against Ayato and Julis — or perhaps more broadly against Seidoukan Academy? I think the next couple of episodes are going to be interesting! What do you think? Is Flora in danger? Or will she be able to take care of herself?